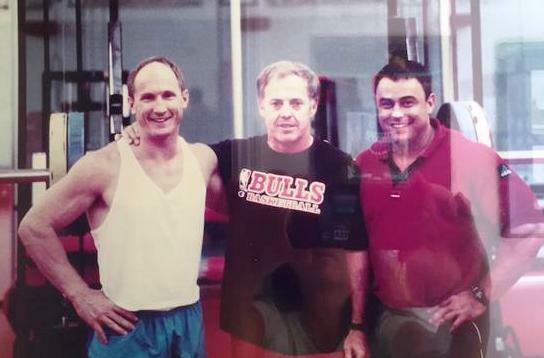 Paul Chek and Charles Poliquin at the Chicago Bulls training centre in the mid 90s. Image borrowed from PaulCheksBlog.com. I was having a listen to this interesting Charles Poliquin Interview on Mike Mahlers website the other day. I do love listening to Charles Poloquin’s information on weight training just because I like training with weights myself. When it comes to weight training variables such as rest, sets, reps, tempo and programme design (for weight training in general) he is considered to be the best in the world. I have pretty much read all of his main books and applied nearly all of what is written within them. If you do want to give your training a boost I highly recommend that you get them, if you haven’t all ready. If you lift weights that is. My training has improved massively since applying what Charles teaches. Anyway, if you listen to the Mike Mahler interview from about half way, you hear Charles Poliquin talking about core conditioning and whether core conditioning exercises are useful. He also mentions Paul Chek. What’s even more interesting is that further on in the interview, Charles talks about an Ice Hockey player who could not get his right shoulder to heal from an injury. According to the therapist who was working with this hockey player, his shoulder wasn’t healing due to unresolved problems with his dad. In short, Charles then said that when people can’t get results they turn to spirituality. He then confused spirituality with organized religion. They are not the same! But the fact of the matter is, if you look at the energetic bodies, the right-hand side is connected with our father (YANG) and the left with our mother (YING). I am still learning more and more on this by the way. Why do you think some people always have symptoms on only one side of their bodies all the time? For example, I knew a girl who had problems with her dad (and men in general because of her relationship with her dad). She had acne on the right side of her face and back, a right hip problem, had twisted her right ankle and had an unfortunate accident on the right-hand side of her face. I have seen the same thing with another woman who had problems with her controlling father. This is a fact, but only to those who are aware of the more subtle (metaphysical) factors of life. Clearly Charles Poliquin (and most people on this planet) are not, as of yet. You should also have a read of the Charles Poliquin article directed at Paul Chek here on functional/stability training and then see Paul Chek’s article on Charles Poliquin in reply here. It is all very interesting! Well, no, usually “experts” don’t have the time or need to read “that kind of stuff” (like we are referring to here) on the web. Experts are usually seasoned researchers in their own right, go directly to other experts, and are not so likely to spend time reading things like this, unless they really feel the person writing it is truly an expert in their field. That said, most legitimate experts do not spend time bashing other experts; they may disagree, but wouldn’t imply things like “people that use Swiss balls should be kicked in the head with steel toe boots” and that sort of thing. ← What is Nikken and what products do they have to offer?